Director: Tamara Jenkins. 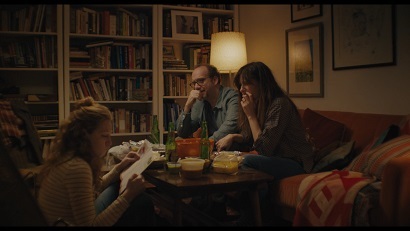 Cast: Kathryn Hahn, Paul Giamatti, Kayli Carter, Molly Shannon, John Carroll Lynch, Denis O'Hare, Emily Robinson, Desmin Borges, Nick Sullivan, Siobhan Fallon Hogan, Lizzy DeClement, Francesca Root-Dodson. Screenplay: Tamara Jenkins. Twitter Capsule: Every other element works in modest service to the exemplary script and cast. Touching, funny, and ever more complex. VOR: ④ Muted cinematic technique may imply less value or risk, but few people attempt such multifaceted portraiture, especially around these under-depicted themes.